Drooling over gorgeous vintage bicycles is one thing, but appreciating their enduring ride quality is another thing altogether. This 1973 Jack Taylor Tourist has been with me for over eight years, and while I rode it quite a bit initially, I eventually set it aside. The bike is larger than my usual size, and I did not adequately assess the lack of comfort associated with a 55 cm top tube length, given that I normally ride a 51. Adding to that are the big 27 inch wheels and 29 cm bottom bracket height. Throwing a leg over this bike is like mounting one’s 16 hand steed for a ride in the country side. However, the very tall riding position is great for commuting. It puts your head up above the fray and helps make you more visible to the car driving masses. So, in order to enjoy this bike I needed to make some ergonomic changes. Back to the drawing board. I needed to bring the bars closer to me. The tall Nitto Technomic stem came to the rescue. Drop bars or mustache bars would push my arms out too far for this top tube length, so I located a vintage city style bar that had the right clamp size for the Nitto Stem. 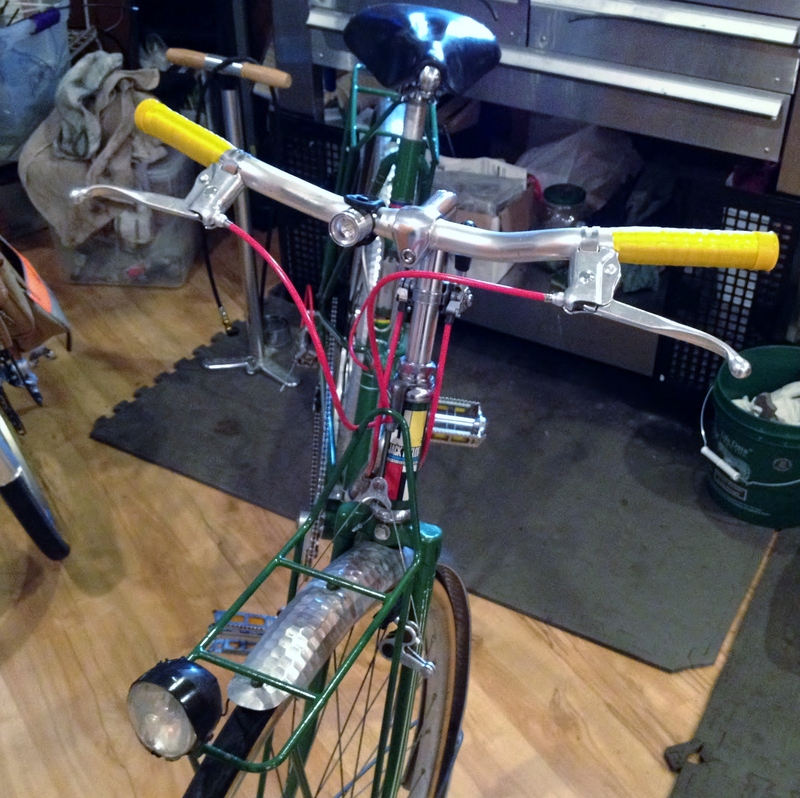 I used Velo Orange levers to complete the vintage look. 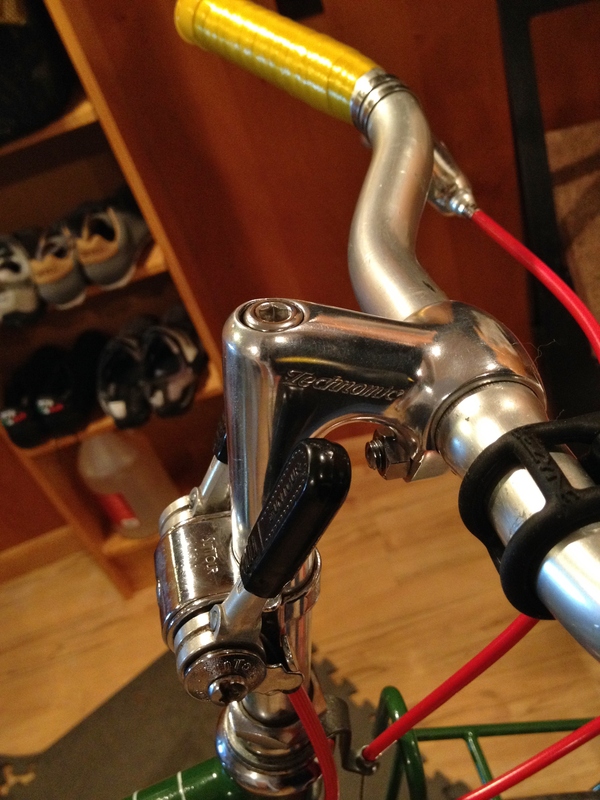 Even though new, they are quite a bit more sturdy than the Weinmann and DiaCompe flat bar levers made in the 70’s. Their only downside is that the levers sit out pretty far from the bar, so they are not the best choice for smaller hands. 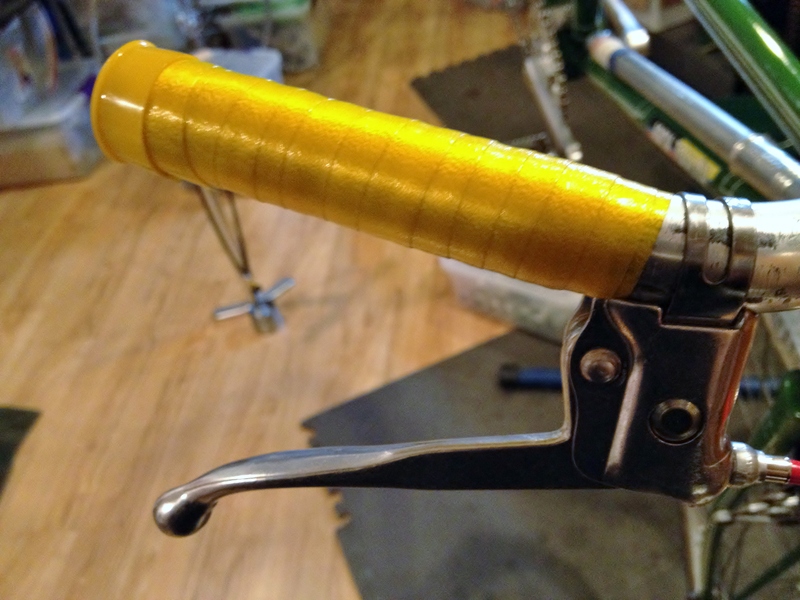 I couldn’t resist using some bright yellow Benotto bar tape, which when wrapped three times over fit perfectly on the grip side of the bars, and which brings out the bike’s vibrant yellow highlights. 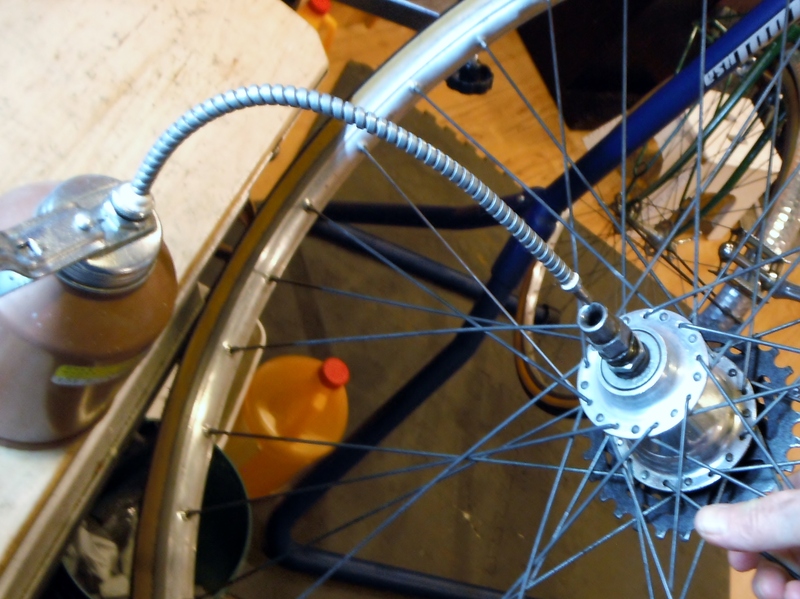 This bike is unique in many ways, and one of them is the rear wheel which features this Sachs-Fitchel 2 speed Orbit hub. 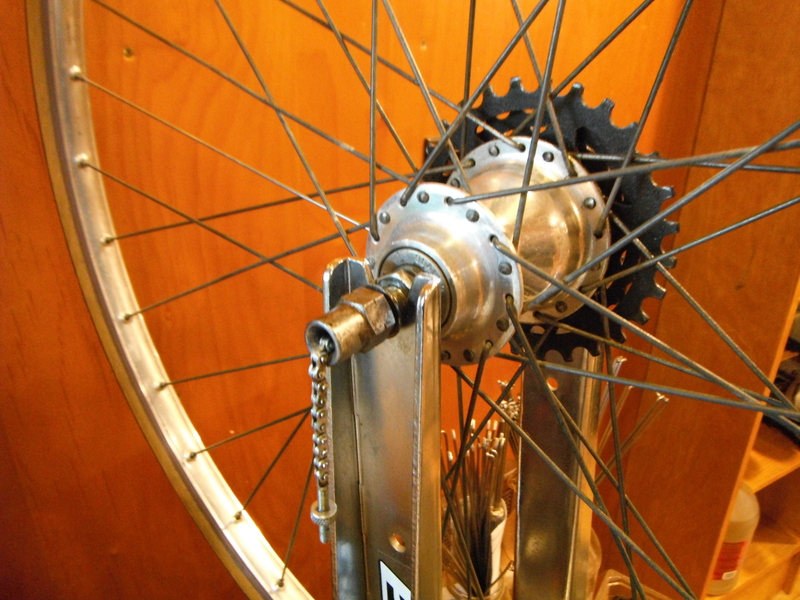 The internally geared hub takes the place of a front derailleur and extra chain ring. I had sent the hub out for a rebuild 8 years ago, not daring to do it myself at the time. It still feels smooth, so I resisted the very faint urge to tear it down. The internal gears can be lubricated by removing the spindle and squirting in a bit of automotive oil. Easily done. 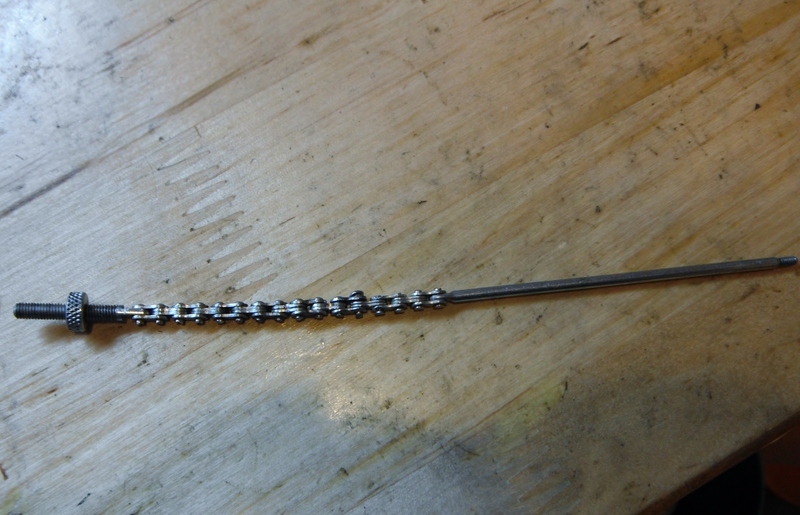 The spindle broke apart a number of years ago, so I did my own repair job using a tiny brad which I banged into the chain links. The repaired link is slightly bigger than it should be, but hasn’t caused any problems. One of the nice things about this gearing arrangement is being able to shift to a lower gear when stopped. 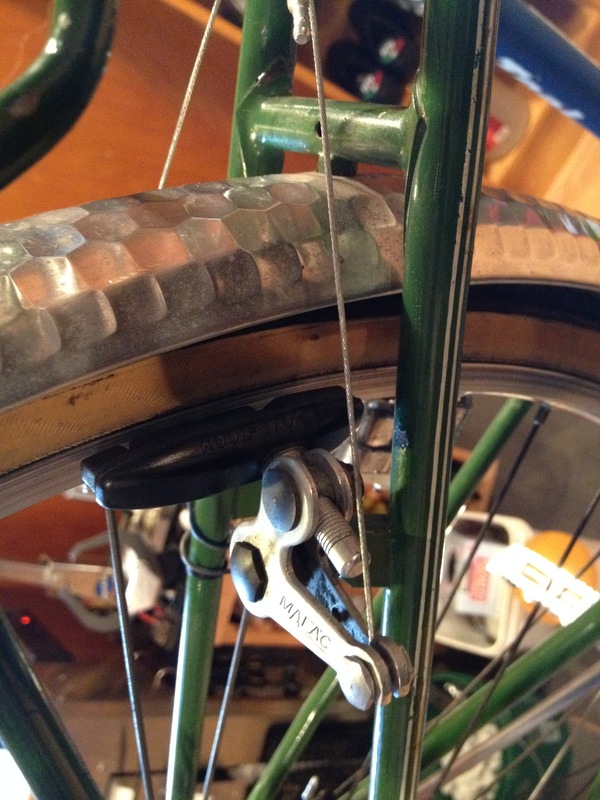 That’s not something you can do with a 100% derailleur equipped bicycle. 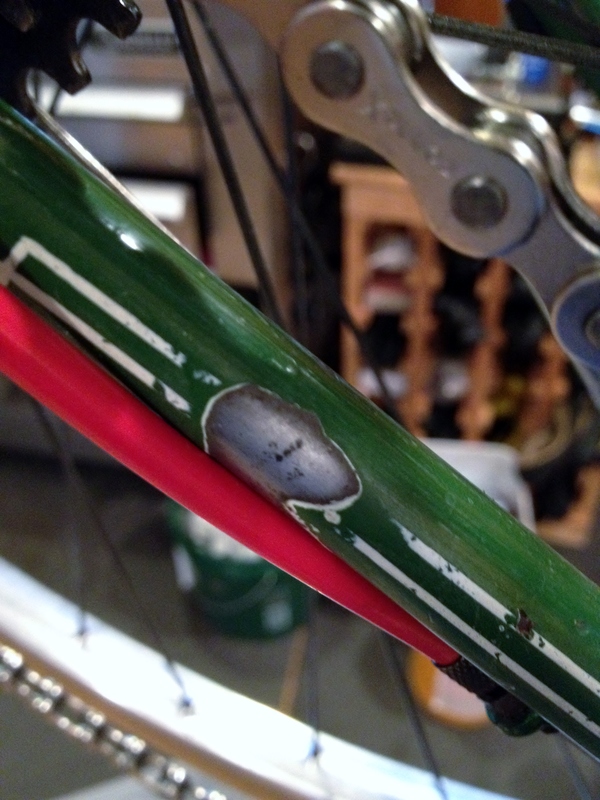 Whenever a bike sits for a while, all kinds of things go wrong. Grease congeals, one kind of metal fuses itself to another kind of metal, bearings embed themselves into their cups and cones, and rust seems to form everywhere. So, there were lots of other issues to address: pitted bottom bracket cups, which I replaced with an exact and pristine match that I happened to have in stock; broken wiring for the sidewall driven Soubitez dynamo; and various rusted areas on the frame which needed to be sanded and then painted (I use clear Testor’s paint). I had considered replacing the dynamo with something newer, but it is actually working just fine, and I can use it as a back up to my battery powered light if needed. (P.S. I hate dynamos). Soubitez dynamo headlight is working! 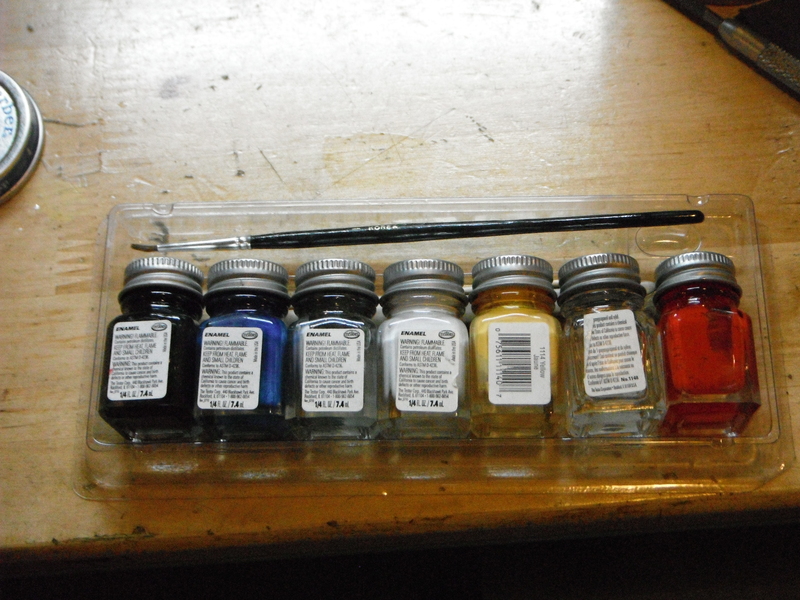 Testor’s Paints – I use clear paint for touch ups. 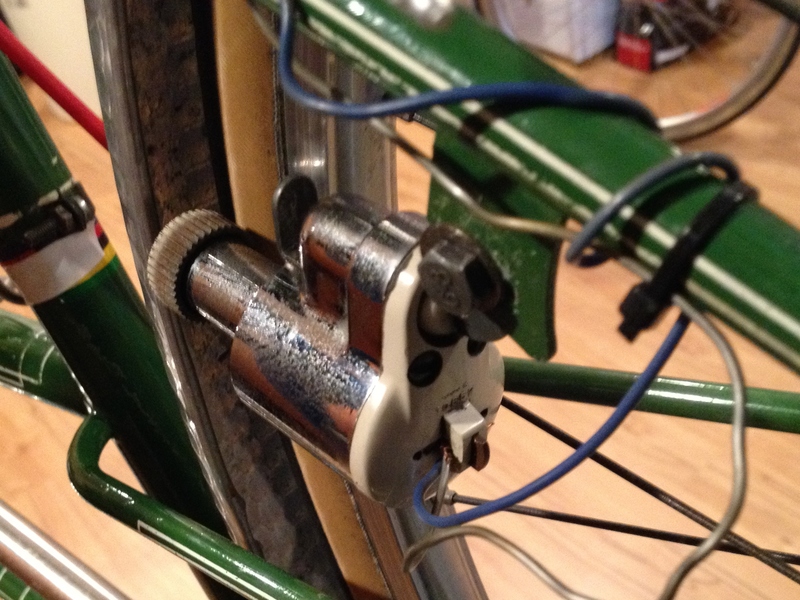 Inelegant wire routing. Oh well. 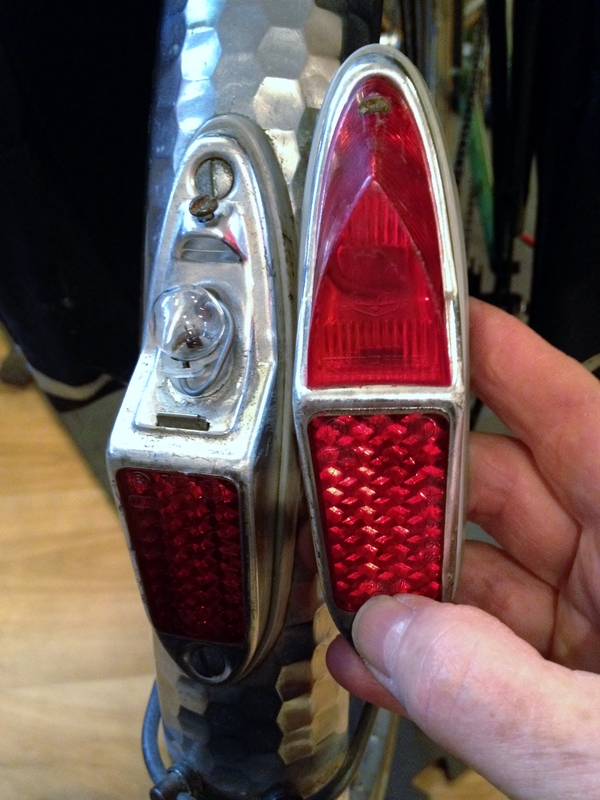 Perfect for commuting – Lyotard pedals with reflectors and cage tabs to keep your shoe in place. Frame touch up – sanded and painted. Very tight clearance due to low tread Stronglight 99 crankset. I really like these IRC 27 x 1 1/4 inch tires. I purchased them eight years ago and unfortunately, they can no longer be found. Not not only do they have a nice appearance, the sidewalls are very supple and the ride quality is even better than the much beloved Panaracer Pasela’s I have ridden. I hope to ride these tire until the bitter end, and replace them only when absolutely necessary. 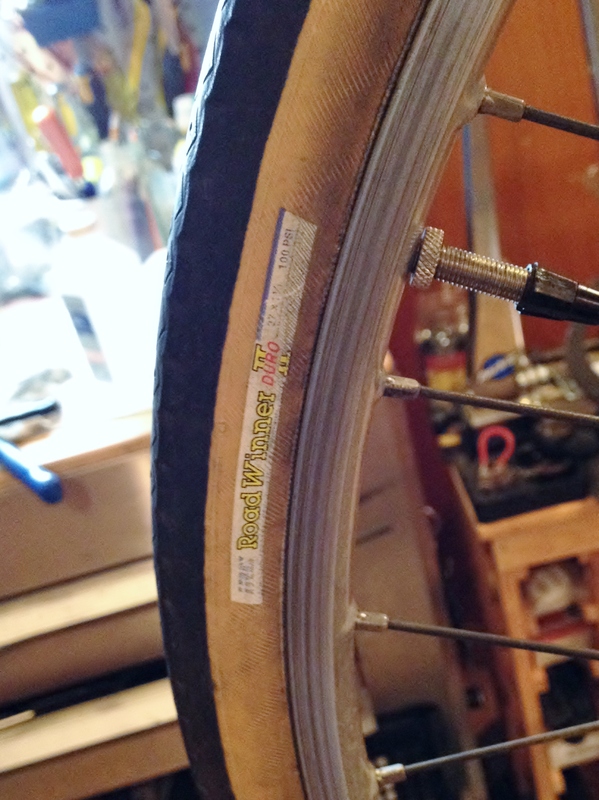 One issue with these older rims is that they cannot tolerate high pressures, due to their design. So, I have blown these tires off the rim more than a few times. Finally, I have settled on 70 psi in the rear and 65 psi in the front, and have had no blow outs since. 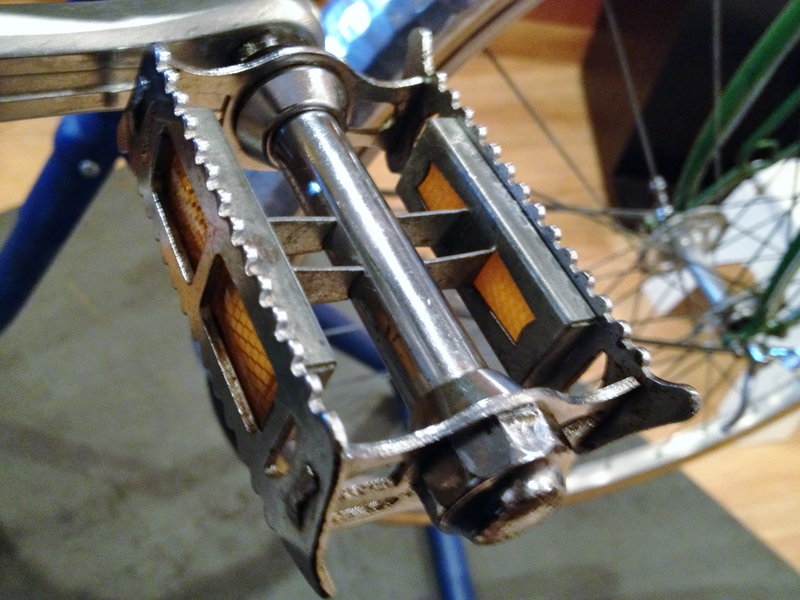 In addition to rebuilding the pedals, front hub, and bottom bracket, I also replaced the straddle cables for the Mafac Cantilever brakes. The brakes, while very powerful, are noisy under hard braking, partly because I am using these Kool Stop pads which not only don’t allow for toe-in, they seem to provide for the opposite of toe-in. Even so, I would rather have these strong and reliable cantilevers for commuting in Portland. 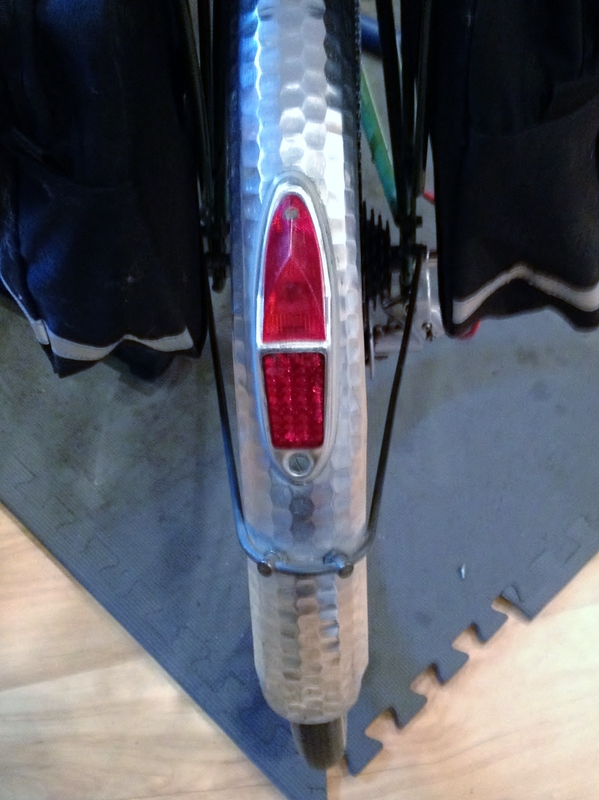 And finally, I sourced an exact match for the taillight with the broken reflector. 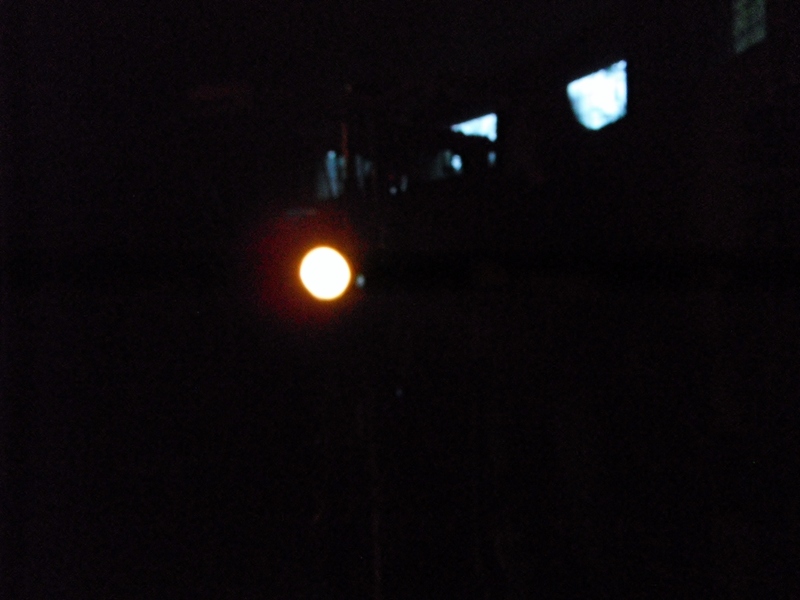 I kind of miss the look of the bare bulb, though. Now it’s time to get back out on this bike into this Fall’s windy, rainy weather and ride the leaf strewn avenues of Portland – hopefully in comfort! 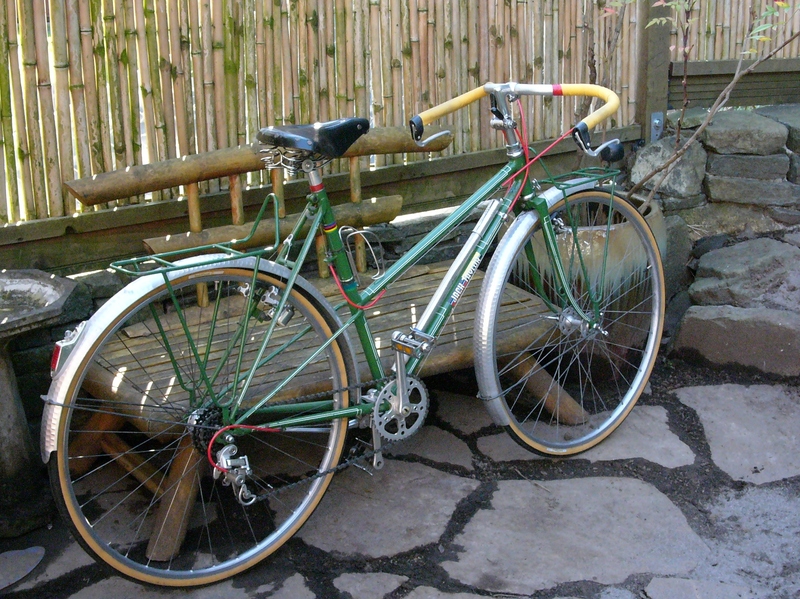 This entry was posted in Bicycle restoration, Commuter bicycle, cycling, Jack Taylor bicycle, Ladies Vintage Bicycle, Mixte, Restoring British Bicycles, Vintage touring bicycle and tagged 2 speed hub, aluminum fenders, bicycle restoration, constructeur rack, hammered fenders, IRC tires, Jack Taylor, Jack Taylor Tourist, Mafac cantilevers, reynolds 531, Sachs Orbit hub, vintage bicycle by Nola Wilken. Bookmark the permalink. Beautiful ride and great description. That bike is a beauty. Where does one get that plastic bar tape? I haven’t seen it for decades. Hi Tom, It’s still possible to find NOS Benotto tape on Ebay. The tape I used for this overhaul was actually used, but since the tape has no glue, it is possible to reuse it if it’s not torn up. I’ve always found the Benotto tape to be strangely compelling – with no glue to hold it in place, it comes undone easily but the shiny look and bright colors are really eye catching and kind of groovy in a fun sort of way. Wonderful Post. 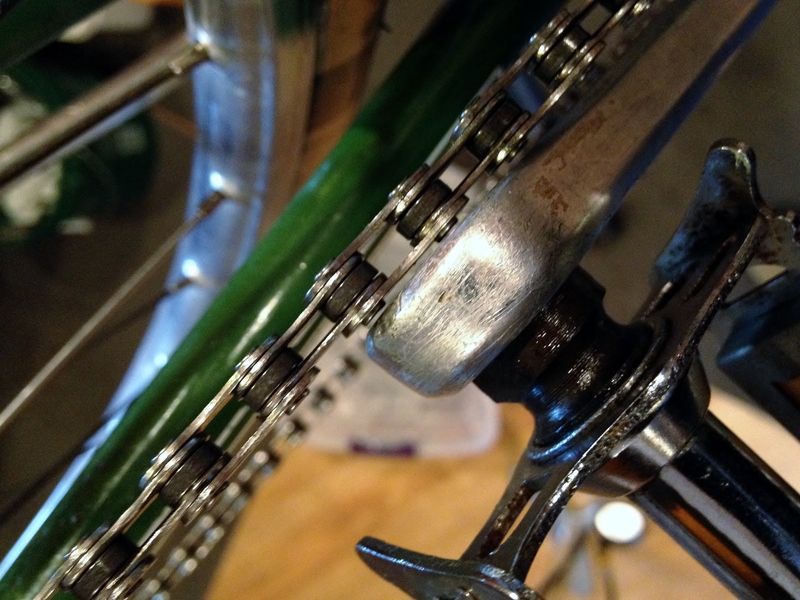 I always like hearing about the challenges and solutions others find when restoring vintage bicycles. It adds to the collective library of knowledge needed to keep these wonderful bicycles rolling. Thanks, Daryl. Sharing our collective experiences and knowledge is hugely rewarding and I think helpful to the entire cycling community. While we look to the future of cycling, the past has a lot to offer. There is something classic yet fresh and hip about a Jack Taylor bicycle. I think it has a bit to do with the logo/badging that was used. Some call the look Mondrian-inspired. I call it eye-catching and striking. The same goes with the box lining and strong, British racing green. All add to the timeless and unique look. Good insight, Josh. The logos used are the Mondrian style and which were apparently designed by an American artist. They provide just the right contrast to the British racing green color of the frame. The bike is so visually interesting I think because of the logos. The arresting logos also provide kind of an interesting contrast to the Taylor brothers themselves who were so humble, skilled, and just went about their work of creating these amazing machines. Thanks, Jim. Nice to find a kindred spirit. Do you have any links to share for the bicycles you mentio – I would love to see what you are riding. Nola, some of my bikes are at Pinterest at this link including the 72 chartreuse referenced International and 1970 JT Ladies Marathon Racer. I should get some “hollywood” shots of these on Flickr for more detail :)! Wow, what a gorgeous bike! Thank you. It’s always fun to ride this bike, and even more fun now that it is more comfortable. It is a real conversation starter.